Every month we conduct a poll on State of Digital. Readers can answer one question and each month we try to figure out a little bit more about how you think and learn. After all, that is what we are here for, to help you learn, to help you become a better (digital) marketer. 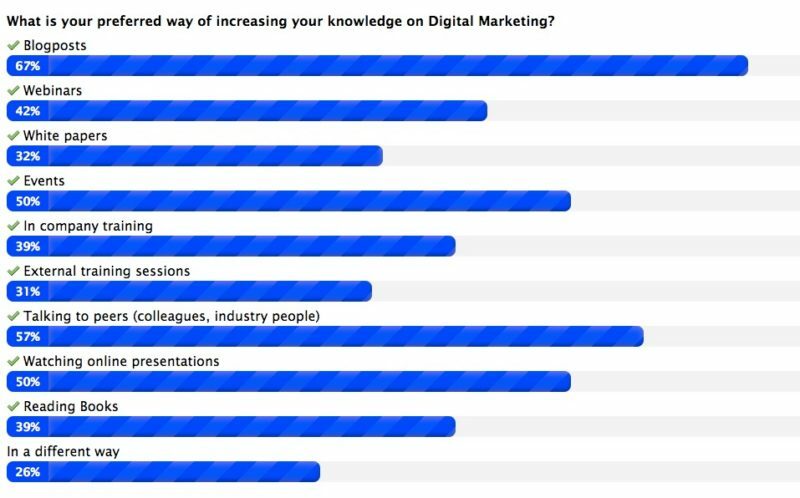 In July we asked you the question “What is your preferred way of increasing your knowledge on Digital Marketing?” Like every month a nice group of readers answered the question. And it has brought us some interesting insights. A very valuable lesson we learned: Digital Marketers (like yourself) prefer to increase their knowledge by listening to… other Digital Marketers! Now I know that sounds obvious. Of course you want to learn from digital marketers about digital marketing. But if we take a closer look at the answers, we can see a pattern: the less ‘official’, the better you like it. As you can see, most readers from State of Digital that answered like to learn from blog posts. 6 out of 10 named blog posts as their preferred way of learning. A thing to realize here is that these blog posts usually are written by people from within the industry, peers. It also gives us a nice thing quote: blogging isn’t dead! You love it! Blogging isn’t dead, its alive and kicking and digital marketers love it! Second on the list is talking to peers, industry colleagues. Over half the respondents said that is how they learn. But where do you find these peers? Apart from at your job, it must be at events, because 43% says they like to learn at events. Again this is a way of learning that has been declared ‘dead’ in the past year, well, not for you! These events can be online or offline. Because the presentations that have been put online are also a very valuable source: again 4 out of 10 respondents chose this. The online presentations are followed by webinars (33%). The actual training sessions seem to be a bit less popular. It turns out that only 21% like to follow external training sessions, where they have to go out of the office. Maybe you don’t like to leave the office, because in company training sessions are more popular (30%). Finally we took a look at the ‘longer content’. For a while white papers and e-books seem to be ‘the next big thing’. And granted, it’s a great way of getting a message across and at the same time to get experts to pitch in. However, judging by your answers, the white papers are a nice to have, but they won’t make you learn as much as actual books. Actual books are trusted more: 30% says they like to learn from books, where as only 22% prefer white papers. But still… it doesn’t beat the lessons you learn from your peers. The question with these polls of course always is: can we trust these results? Are these numbers that show a trend for the industry? Can we trust them to define our strategies? Well no, I wouldn’t do that. These answers came from a very small subset of our reader base (around a 100). And ‘we’ are not the average digital marketer. On top of that: never ‘just’ trust results of polls or surveys and base your strategy on it. Because it doesn’t tell you everything, you will need to find out more first. So how should we use it then? That doesn’t mean these numbers are useless. Far from. The answers are an indication of where you should or could be looking at when considering your content marketing strategy. Especially for those who actually target digital marketers. These numbers can be the first step. And then you start researching more. Figure out what fits you best and figure out how you would like to share your knowledge to Digital Marketers. It’s a nice start, that’s what it is. For us it’s a nice insight into what you want. We love the fact that you like blog posts this much and that you want to see them being written by your peers. Because that is exactly what we do! And we will continue to do that and make them better and better! Our new poll: What kind of presentations do you like? So for the next month we want to know a bit more from you again. Again focused on the learning aspect of Digital Marketing. Following up on this question, we’d like to dive into presentations a bit. As you saw you like presentations, but what type of presentations do you prefer? Inspiring? More practical? Or a mix? Tell us, below, on our poll page or in the sidebar. Oh, and do us a favor please. Share the poll as much as you can, so we will get as much answers as possible to make this the best poll out there!